Have you ever wondered what Indian food is actually like? While Indian & Chinese settlers actually came to Indonesia about around the same era, our fellow Indians' culture is still less understood. But thanks to industrious Indian families, we now can enjoy excellent authentic Indian cuisines without having to travel all the way to the land of Taj Mahal. 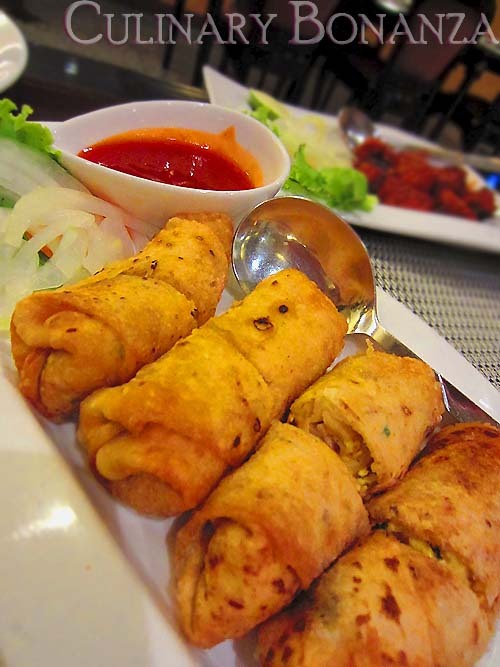 Among the popular authentic Indian restaurants in Jakarta, Queen's Tandoor is one name that you certainly should know (and try). Queen's Tandoor quotes itself as "Indonesia's biggest and most well-established chain of Indian family restaurants". An overstatement? Hardly! The numbers can easily prove it: today Queen's has 2 outlets in Jakarta, 3 in Bali, 1 in Singapore and another 2 in Kingdom of Saudi Arabia. Alright, enough babbling, let's get to the tummy business, ey? We went to the Thamrin outlet the other day, which is quietly tucked at the basement of an office building (Plaza Permata). 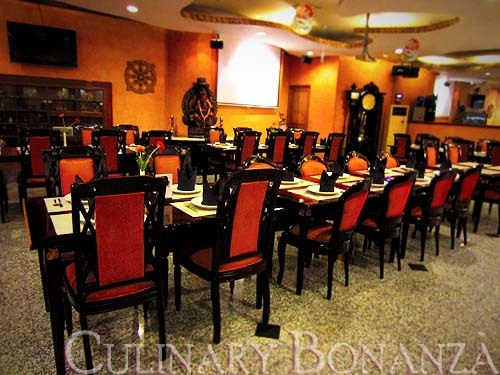 The decor is nothing fancy, a mixture of Indian and conventional (I'd say old) restaurant setting. Unfortunately, the restroom is located outside the restaurant, but it is not too far. The menu is very extensive, that we were at a loss of what to order! There were Indian cuisine (vegetarian and non) on the first few pages, then the menu diversified to Chinese (talk about bakmie and such on the menu). Lucky the crews were knowledgeable and were patient enough to explain to us, especially the Indian terms. While waiting for our orders to come, we were served a big piece of papadums - complimentary (such courtesy is similar to bread baskets served in Italian restaurants). 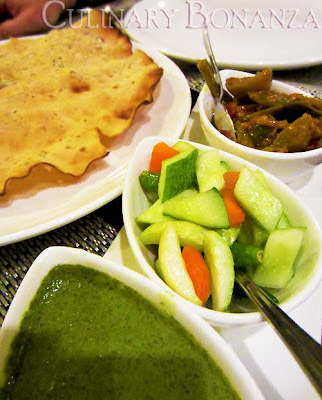 It came with 3 types of condiments: sour pickles, fresh pickles and mint chutney. The mint chutney which tasted salty, fresh and green, is best of the 3. Although personally when eating papadums, I still prefer the mango chutney served in another Indian resto I've been to last year. Since we ventured to an Indian restaurant, we chose the Masala Mix from the beverages menu. 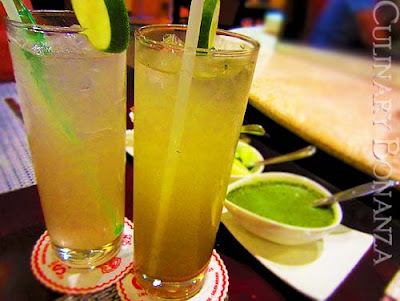 What's awesome was that these drinks could be made non-alcoholic (as in mocktails). I'd strongly recommend the Masala Daiquiri. It's an interesting mix of fresh lime juice and other spices that you normally use for cooking (coriander, chilli & chaat masala), spiked (alcohol-ized) with white rum and orange curaçao. As opposed to the Ginger Trail that's rather salty (due to the rock salt used as one of the mixture). Otherwise the Ginger Trail would've tasted perfect. The main course was finger-lickin good! 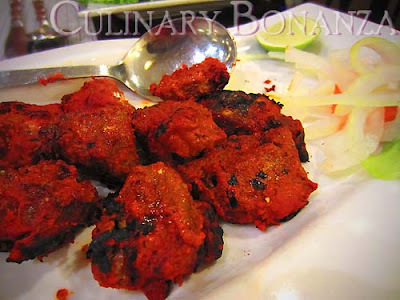 I love the Boti Kebab, which is simply tender & boneless lamb cubes marinated in rare & hot spices. 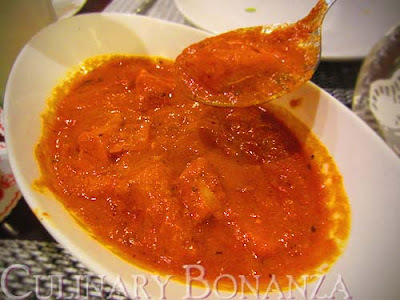 The Butter Chicken Curry was a treat to the tongue too! The gravy was perfect as a dip for our Garlic Naan (bread) and to accompany the Basmati Rice. but it's probably even further from your house, is it? Dari kapan pengen coba makan di sini, deket sama kantor juga, sayang quite pricey jadi belum jadi-jadi mampir.